Sleeping used to be one of my favourite things. I could sleep all day, all night, at anytime! It was a great escape, where the real world became nonexistent. But of course, like everything else that changes during pregnancy, sleep is one of them. For starters, laying down is by far the most uncomfortable position. It is very difficult to find a position that suits you and your baby amongst all the sore spots and doctors orders. If by chance you do get comfortable, or fall asleep from pure exhaustion, soon enough you will get woken up. So far in the last couple months, 1 of 2 things have happened practically every night. You either wake up from the worst heart burn in your entire life, which results in you running to the bathroom and seeing all your days food for the second time around, or you wake up from a dream. Waking up from a dream doesn’t seem so horrible does it? Oh no but apparently pregnancy hormones do not only affect your daily activities but also your dreams. Having dreams while pregnant means that they are highly enhanced in details and clarity. These dreams feel so real that they haunt you for days to come. Everybody knows that you often dream about what you’re thinking about subconsciously. So being young and pregnant, my dreams often consist of my boyfriend leaving me for somebody else. This is normal yes, considering it was an unplanned pregnancy. The only issue I am having with them is that I dream about who he is leaving me for and what they are doing. I know we are in a society where a lot of women enjoy seeing their significant other getting it on with someone else, that it should get me all hot and bothered. Well, I am definitely bothered. On top of my other raging hormones, I was already feeling irritable towards everything and everyone. Little noises I can’t control, or feelings with unidentified causes. One day this week I walked into work and had this uncontrollable amount of anger towards one of my coworkers. Sometimes it happens that someone’s face just annoys me but this was more than that. Let’s put two and two together, it’s a girl. It took me little time to remember the vivid dream I had about this coworker and my boyfriend. Silly right? I’m still having trouble looking at her without remembering it. 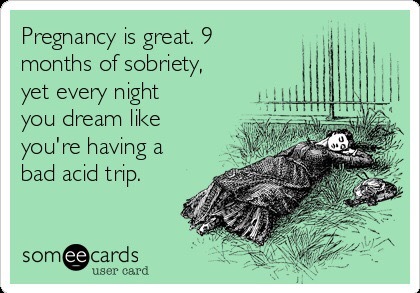 Did anyone else have dreams like this while pregnant?